The Stevensons Standard Ceiling Range of 25 decorative plaster ceilings offers huge cost savings to our customers and is derived from our substantial archive of patterns and moulds providing beautiful high quality ceiling enrichments. The Stevensons design service will produce a drawing to show how the ceiling you have chosen will sit in the available space. The range of ceilings is calibrated to suit a broad range of ceiling heights, room sizes and styles. 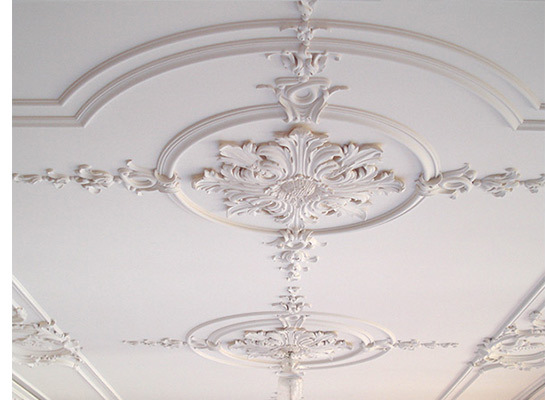 Some decorative ceiling designs assume that our plasterwork will be applied as components to an existing ceiling. Other designs assume that our components plus the background plus, if required, secondary metalwork to support the installation form part of our offer. With all of our decorative ceilings we offer the Stevensons worldwide installation service. The Stevensons archive and mould bank has been accumulated over the last 35 years through our involvement in prestigious contracts and commissions. The significant cost of originating the fine detail appropriate to decorative ceilings has therefore already been fully absorbed and to this extent the cost of commissioning one of our standard decorative ceilings is substantially discounted. The standard decorative ceiling range is being continually expanded. We also have a wide range of Coffered Ceilings designs.